Interview: Dr Nishtar, leading health reformer in Pakistan by Ahmed J Versi, published in The Muslim News on Friday 24 August 2012. 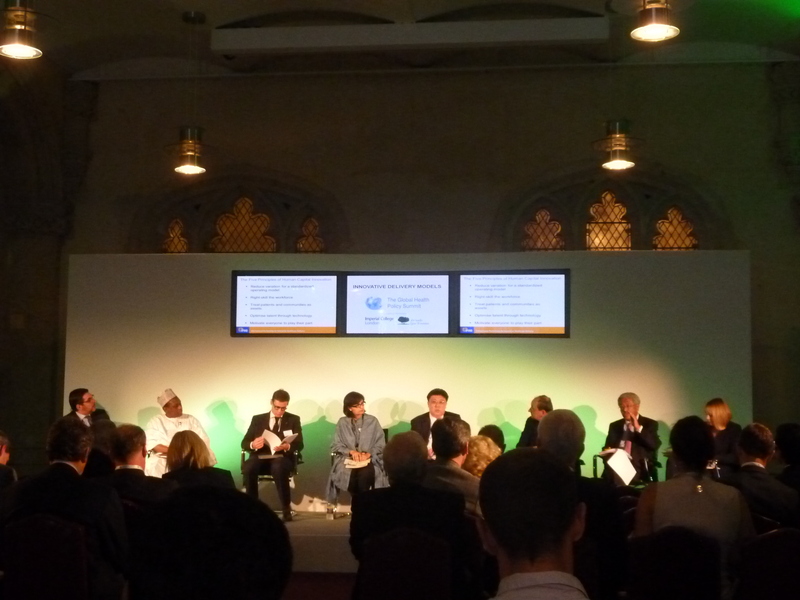 August 23, 2012: The Institute of Global Health Innovation at the Imperial College London and the Qatar Foundation hosted this year’s Global Health Policy Summit on August 1, 2012 in London. The Summit was held at the Guild Hall; leaders from all over the world with a common aim of creating an active global community of health innovators and reformers were presented with an opportunity to collaborate to tackle the challenges facing healthcare systems. Dr. Sania Nishtar was a panel speaker at the summit’s Innovative Delivery Models session at the Summit. New documentary on Heartfie Health Financing, 2012. August 17, 2012: Read the recent BMJ story on Heartfile Health Financing. Great trepidations shadow Independence Day. With the country’s increasing isolation in the arena of international politics, poor state governance, and a polarised society, Pakistan survives today primarily on the resilience of its people. This is a time to reflect on where we stand in the broader global context and appreciate the nature of the imperative. Foremost, it should be recognised that Pakistan today exists in a world where interconnectedness and interdependence is the new global order, creating opportunities but also risks. An increasingly multi-polar world with rise of the emerging market economies-two of them in our immediate neighbourhood. We now have a world where the G20 matters as much as the G8. Similarly, we also have a context where decision-making structures of the post-World War II global governance system must now accommodate new international players. Pakistan is clearly not one of them. The country’s “geostrategic significance” should not be confused with the importance of the emerging countries, which, despite many weaknesses, have strong prospects for sustainable growth and robust institutions. On the other hand, Pakistan’s geostrategic “significance” and what it has entailed in terms of policy choices over decades have taken a huge toll-in the shape of ideological polarisation, religious extremism, militancy, terrorism, sectarian ethnic strife, separatist movements, and the rapidly fading writ of the government across large swathes of territory. Pakistan needs to come up with a policy agenda and ensure that it has the support of all stakeholders within the state system so that a peaceful role for the country can be carved out in a globalised world. Secondly, for the last sixty years, the world has recognised GNI as the measure of national progress and for more than a decade the Millennium Development Goals (MDGs) have propelled development and poverty eradication efforts. Both these metrics may be up for a rethink, globally, particularly as the MDGs come to term in 2015. The reasons for this are evident. The world has reached unprecedented levels of technological and organisational advancement, and productivity. Yet billions go hungry each day. World poverty and economic inequalities are soaring. Population growth is becoming a challenge, especially with regard to the pressure it places on natural resources. Our planet is increasingly becoming more susceptible to environmental degradation, climatic change, natural disasters and other catastrophic events. The world is increasingly becoming aware of the need to reduce poverty, advance social equity and ensure environmental protection on an ever more crowded planet. The sustainable development agenda, and its metric, the Sustainable Development Goals (SDGs), are therefore becoming a normative expression of public hope. Broadly, this agenda, as outlined at Rio+ 2012 comprises three pillars, economic development, social development and environmental protection. In this transformation the world is also more conscious of the need to accord attention to building safeguards and oversight, given the havoc played by collusion and unsustainable economic policies, which have led to the present economic and sovereign debt crises. Pakistan epitomises most of the problems the world is facing. In addition to its international isolation, Pakistan is in an economic quagmire, trapped in a cycle of debt-both problems have a compounding effect. Economic inequalities are widening. Today, Pakistan ranks 145 out of 187 countries on the Human Development Index scale. Our global governance and competitiveness rankings are plummeting while graft and collusion reach new heights. Erosion of the state’s ability to deliver and societal polarisation is evidenced by the case of Polio eradication, where the entire organisational might of the state is unable to achieve, what can be regarded as a relatively straightforward goal. The country’s population is projected to double by 2050-making Pakistan the fourth-latest nation from the current ranking of sixth. In terms of climatic change and natural disasters, Pakistan has experienced multiple setbacks in the last decade-earthquakes of 2005 and 2008, and the 2010 and 2011 floods. The country’s vulnerabilities are well highlighted in Planning Commission’s 2010 Report on Climate Change. Also, it must be appreciated that in today’s world national security is no longer about wars, genocide and human rights abuses. Economic, information and cyber “warfare” can cripple countries; cross-border movement of diseases can buckle economies and control over shared sources of water can define sovereignty. State, economic and human security dimensions are deeply interrelated. Water and energy insecurity, as well as political and civic instability, lead to economic and food insecurity; both of these have implications for poverty and deprivation. These, in turn, have a causal linkage with conflict and violence in a society, which negatively impacts economic and human development and creates a vicious cycle. Pakistan faces many challenges in that respect. Energy is the lifeline of economic development-conversely, our energy crisis is compounding. Water is the backbone of an agriculture-based economy-we are running into a serious crisis. Sustainable state security is dependent on human security-our unique patterns of conflict have become a threat to state security in its own right. Pakistan must accord attention to the structural impediments that stand in the way of its ability to deal with these problems. It must define security and pursue national-security policies accordingly. Pakistan needs to aim for sustained growth and develop mechanisms to accrue benefit of growth equitably to populations. The country needs a consolidated vision for reform across several sectors, related capacity to mainstream transformational change and multi-stakeholder oversight of the process of its implementation to ensure that reform outlives administrations and is not held hostage to short-term stakes. These broader outcomes are dependent on success at a more basic level-addressing elite capture of the state, poor governance, eroded capacity of institutions, bureaucratic paralysis, institutionalised corruption, patronage, politicisation of decision-making, tolerance to circumventing procedures, systemic manipulation, crony appointments and lack of attention to accountability and transparency. These manifestations of systemic malaise undermine prospects for improvements in Pakistan’s economic and social indicators. More fundamentally however, Pakistan needs to be true democracy first, in order to achieve these objectives. The Arab Spring has served as a catalyst towards democracy on a global scale. Within this trend, Pakistan appears to look good on that score, as far as “popular vote” is concerned. However, democracy is not just about “majority rule.” It must also function as a set of constitutional devices, where restraints upon the elected government can be ensured, and where all the pillars of the state function without prejudice. As a value, democracy is closely related to liberty, equality, freedom and rights and, as a principle, good governance, fairness, transparency and accountability are its hallmarks. Pakistan needs a fundamental rethink around its current democratic dispensation as a starting point, if it has the will to act. 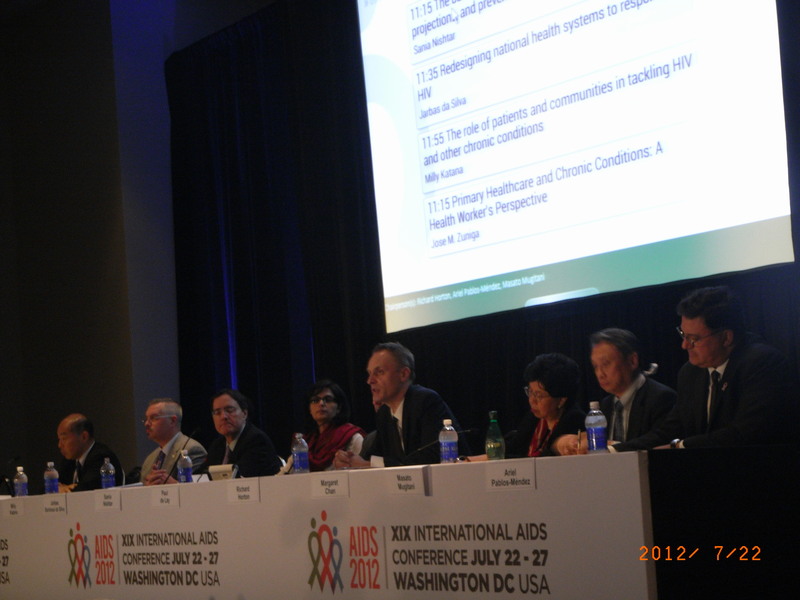 August 07, 2012: The World Health Organization and UNAIDS organized a joint high level satellite meeting, the International AIDS Conference on July, 22nd 2012 in Washington, D.C. The session focused on the health systems’ challenges related to the management of chronic conditions with a particular focus on HIV and NCDs. Among others, Margaret Chan, Director General of WHO participated in the session, moderated by Richard Horton. Dr. Sania Nishtar made the opening presentation at the session. August 02, 2012: Dr. Sania Nishtar was interviewed by a premium media brand, monocle 24 for their radio show, The Entrepreneurs which has up to 50,000 listeners per episode. In her interview, Dr. Nishtar spoke about the unique Heartfile Health Financing program which allows healthcare access to the “poorest of the poor” through its technology interfaced health financing program. To listen to the full interview, click here and skip to 19 minutes 53 seconds.